Today it was time for Mira and my second competition in Obedicenclass 1. For the first time we competer at a stable and I have been a bit nervous about this, that all the horsesmells would distract her. But I have had the opportunity to practice in similar environment twice and she has done so well, so the smells was not a problem. We started with laying in group. Mira was between a German shepard and a Boxer. Both of these dogs moved, either crawled or walked away. But despite this Mira stayed so I was very happy with her 10 points there! Also checking teeth went well and another 10 points. When it was our turn for the programme she felt good as we got in but within seconds it went downhill. Looking at the video I think is looks like she is trying to make a bigger distance between her and the judge, walking a little bit behind me past them. 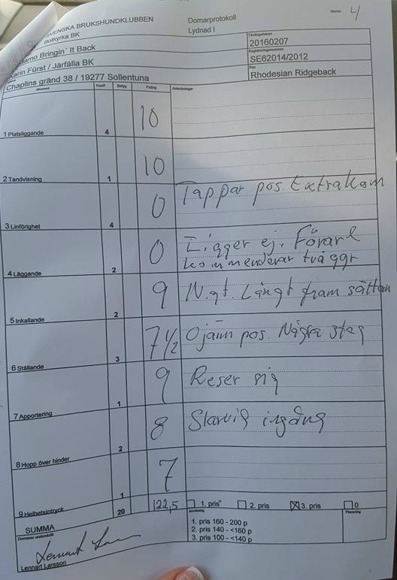 After this things at least got better... Recall went well and she got a 9, standing during heal a 7,5, fetch a 9, jump 8 and overal impression a 7. Well, I know we can do a lot better, but still I am pleased with her/our overall performance. New competition in two weeks! Somehow we did manage to end up as 7th Best of the day, 13 dogs present. So we did not do the worst performance of the day!